1.0 Introduction:This report is the pre requisite of the course marketing under the instruction of A.A.M Baquer. Sales Promotion and advertising is one of the basic components of marketing and to be a business graduate, it is important to us to know how this promotion or advertising process takes place in local market- what are the processes involved. Sayma Enterprise Industrial Corporation (Pvt) Ltd is a place where I learned the business dealings. This organization has created a positive image to the customer’s mind by providing better service. This organization has introduced some new model of PET product that needs some advertising to promote its sales. As it maintain the pace with the competitive business world, its activities, culture, philosophy and style leads an intern student to be the best at any field of working life. As an intern student I had got the opportunity to work with this organization for three months and acquire idea about real business world. To write a report it is necessary to select a topic. A well-defined topic reflects what is going on to be discussed throughout the report. The topic that has been assigned by organization supervisor is “Promotion mix-Sayma Enterprise Industrial Corporation”. The report has discussed how the organization can improve the sales level of SIC. In turn the production, by following the suggested promotion mix. The general objective of this project is to complete the Internship. As per requirement of MBA program , one student needs to work in a business organization for three months to acquire practical knowledge about real Business operation. 1. 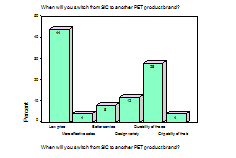 Identifying the customer’s perception regarding SIC’s pet products. Identifying the customer’s view regarding different aspects of SIC’s products including size, grip ability, cap, transparency, shape, outlook, design variety- in brief the customer’s satisfaction level in these specific areas. Revealing different sales promotional tools that SIC are currently using such as Consumer promotional tools and Trade promotional tools and its impact on the customer’s buying decision. What additional benefits (service) that customers expect from SIC like credit facility, transport facility incentives and design variety. 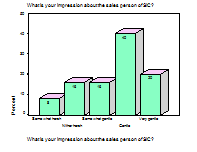 Identifying the customer’s satisfaction level about the efficiency of sales force of SIC. Receiving the insights of customers and developing advertisements for existing and new customers; also preparing a product feature brochure and a web side to make the customers knowledgeable. This is a “Conclusive” research work. It is a marketing research to gather preliminary information that will help define problems and suggest proposition. An overview of plastic Industry of Bangladesh. 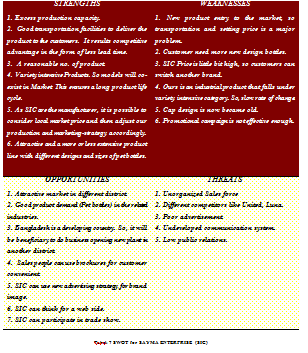 The role that SAYMA ENTERPRISE (SIC) is playing in the industry, its profile including different marketing aspects. The products that SAYMA ENTERPRISE (SIC) is producing and locating these products in different product classification. q Bangladesh are technologically undeveloped countries with very little important information are readily available. So, a huge effort was needed to collect the necessary information. It resulted in some minor changes in the pre- conceived report design. q Every organization wants to maintain the confidentiality of the information. Because of this reason, the managers and officers who were interviewed did not disclose much information. Both the Secondary and Primary survey data is used for the completion of this project. This is mainly a primary data base report. However, in this project, the researcher also used both Internal and external secondary data. The company profile, its year of establishment, its capacity and production, its performance. The products that it produces. The company’s growth (in terms of income and profitability). The given areas PET bottles demand supply consumption and sources. Primary data is also known as survey data. 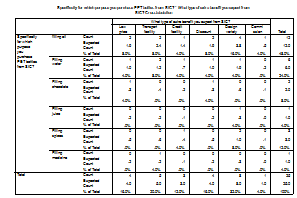 This type of data is collected from the respondent. Non- probability judgmental method (refer to Literature Review) of data collection is followed in order to collect the primary data. As a part of this project work, the researcher went for a seven days visit to Chittagong and Sylhet market, where SAYMA Enterprise’s products are being sold. Besides filling up the questioners, he collected the primary data by personal Interview with the SAYMA Enterprise’s potential buyer. It is important here to mention that, there were two or three questions under each proposition and each proposition was established to get information about an objective. 1.7.3.1 Target Population: This given report dealt particularly with Industrial buyer of Sayma Enterprises. So people who are connected with this procedure in some way or other are those to whom I was most interested in. Thus buyer of SAYMA ENTERPRISE came within my consideration. 1.7.3.2 Sampling unit: Every individual who was chosen from the buyer’s list of Sayma Enterprise for the interview purposes is considered as sampling unit. 1.7.3.3 Sample Size: We followed the quota sampling process. Total number of samples of this research is 25. These respondents were from different geographical groups to make our findings more accurate. 1.7.3.4 Sampling method: As the study field is very specific and only a few particular people are aware of the necessary information that I am looking for, selective sampling method was used to pick respondents for the interview. Beside that I also use telephone interview, email and questionnaire. Questionnaire research design process in an orderly and specific manner. 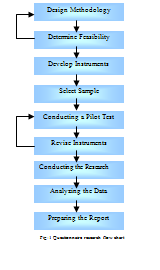 The flow chart was used for the successful completion of research process. There are two feedback loops in the flow chart to allow revisions to the methodology and instruments. Chapter Seven: Findings & Analysis. Chapter Nine: Conclusion & Recommendation. Sayma Enterprise Industrial Corporation (SIC) is a product-oriented organization. It seeks to produce modern product on the basis of consumer’s need and want. As we mentioned earlier that SIC has different SBUs. Now we will go through those one by one. We will discuss the background, history and activities of those. “To place and manage our products on the most rewarding markets and deliver the highest level of service to support our product of exceptional value through a closer understanding of our customer’s requirements.” —this is the marketing objective of Sayma Enterprise Industrial Corporation (PVT) LTD. In the early years the reputation of Sayma Enterprise Industrial Corporation spread around because consumers wanted product variation and different attributes. Pet bottles have become very much popular in recent years. The SIC meets the growing customers needs and wants. Sayma Enterprise Industrial Corporation established an industry on one (1) acres of land in Shampur industrial area for producing pet bottles. As SIC have such types of machines that it can produce any types of plastic products. It should be mentioned that SIC could produce 20,000 bottles per day, though it can produce more. The total number of workers in this SBU is 40, including the managers in different levels. Total number of machines in this industry twenty (20). Another SBU of SIC is in Khilgaon area (Dhaka). This is an industry, which produces audiocassettes. This is the second major SBU of SIC. It supplies cassettes to different recording studios. The total number of machines it has is ten (10). About 40 employees are working here including the managers. The minor port of the organization is situated at the national stadium area (BaitulMokarram). Its name is Habibco. It sells sound systems, electronics equipments which are used by regular users, stabilizers, electronic backup systems etc.It has twenty seven(27) including managers in different levels. Habibco also has two other sales centers in Stadium market. But the sales of the Habibco are so high that they use those as storeroom. Mr. Hafiz Uddin Ahmed founded Sayma Enterprise Industrial Corporation. But if we want to know the initial background of SIC we have to go back in 1965. Mr. Hafiz established Habibco at that period. Later he established Sayma Enterprise Cassette Company in 1985. In 1960 he established Sayma Enterprise Pet Bottle Company. Later his son Mr. Kamal Uddin Ahmed joined in this organization. He took the responsibility of the management of SIC pet bottle and audiocassettes. But Mr. Hafiz Uddin remained the Managing Director of SIC. The administration and management of SIC is directed in the hand of the founder Mr. HafizUddin Ahmed assisted by the board of directors. Founder chairman Mr. Hafiz Uddin Ahmed and Director kamal Uddin Ahmed also assisted by the different management levels. Well-trained managers and lower level employees of the production side also help the organizational activities. Different mineral water companies and vegetable oil companies seek large quantity of pet bottles for their products for packaging purposes. They seek large quantities of new designs, which only produced by Sayma Enterprise. The corporate level of SIC also conscious about the need and demand. They also want to produce new design. SIC produces different types of blank cassettes for music companies in Bangladesh. They import row material from China and Hong Kong. They produce new designs, new shaped blank cassettes, which have vast demand in market because of their high quality. Habibco which is another part of Sayma Enterprise, imports modern music systems and they are the 12th best seller of Indian famous sound system company Ahuja. The organization has planed for extending the number of a plastic product, the number of new shaped blank cassette also. They want to produce CD, which has a vast demand in current music market. They want to produce one-time plastic bottles for Coca-Cola if they would make an agreement. Sayma Enterprise Industrial Corporation follows organizational curriculum of international standard with some additions as conforming to the demands of the current consumers market. The following system of production, which is considered flexible for both domestic and foreign countries, has been introduced in the organization. The Organogram for Sayma Enterprise Industrial Corporation Pvt. Ltd. is given in the next section. There are six Directors who work independently and report to Managing Director of the organization. 2.10 Division of Human Resource & Corporate Affairs. Motivated employees being the most critical ingredient of success in today’s competitive world, human resource division is getting more and more priority in our country. At Sayma Enterprise Industrial Corporation Pvt. Ltd. already has a strong and competent Human Resource Division. As the integration process is still going on, this division is try hard to garner the best out of this merger. This division is divided into four departments. A brief description of all the departments along with their functions is given below. Contracts and recruitment of employees according to the guideline of the organization and the laws of the country. Processing the separation from service due to death, resignation, retirement or dismissal etc. Transfer or posting of the employees according to the need of the organization. Classification of the employees based on the job evaluation carried out partially. Fixing employee’s salary, promotion, increment etc. Allocating bonuses, insurance, retirement benefits, grievance handling etc. Dealing with misconduct according to procedures laid down in the company rules and the laws of the country. This department is also responsible for different types of leave according to the laws of the country and company policy. This includes different procedures, data entry and record keeping. Identifying the training needs of the employees through the performance review system. Preparing a training calendar according to need of the organization. Keeping records of the training programs for further evaluation. Developing the personnel through partnership of the employees. To provide maintenance support to all other departments like house cleaning, electric substation, vehicle maintenance, office management etc. Services related to law i.e. work permits for consultants, court attendance, police affairs etc. Arrangement of welfare activities like canteen facilities, sports, milad, family reunion etc. Ensuring the compliance of all the Acts and Ordinances of Government of Bangladesh related to labor. Publication of internal news letter. Provide information to maintain sound relationship among various departments and employees. Legal and statutory accounting and reporting according to the Companies Act. Full revenue and expenditure information consisting of profit and loss Statement. Cash flow statement, balance sheet, transactional recording etc. Maintains accounts receivables and payables. Planning-Budgeting & forecasting of finance related information. Explanations and interpretations of figures. Selling the products in the market through personal selling, sales force, tele marketing. Selling the products to the oil filling company, water filling, juice manufacture etc. Formulate all the strategies regarding sales. Budgeting and forecasting of sales for each product and also maintaining the rolling forecast in each month. Distribution in coordination with Customer Affairs Division. Carry out investigation to determine product performance, company image, customer satisfaction, distribution system performance etc. Conduct product induction training, refreshers course etc. Keep acquainting the sales people with innovative ways of selling their products to make them more competitive. Maintenance of the machines, which are not related to production like vehicles etc. To purchase every thing this organization requires starting from pencil to heavy production machines. To ensure that products are available whenever and wherever necessary. To give the parties feelings that SIC stands every time with its customer without considering the importance of people. SIC are manufacturing different sorts of pet bottles in a manufacturing plant situated in Shampur at Dhaka (Naryangonj). It is doing business significantly in Bangladesh and due to the over capacity of production, its intention is now to promote its sales through advertising and other promotional activities. These bottles always sold without any labeling. The company’s buyers of its products usually label the bottles and jars in brand names according to their respective needs and convenient. From the definition of business marketing, it is clear that it is going to increase its business products sell in the local business market of Bangladesh. 2) Common technology and marketing insight can be used for different designs of bottles. It encourages observers to view them as a group. þ Customer needs are very diverse. þ Customer needs are relatively stable over time. þ Customers are potentially loyal. þ Competitors are known but sometimes surprise with new products that serve previously unrecognized niches. þ Firms search for economics of scope. þ Flexible manufacturing processes are exploited to shift easily among multiple designs in a stable universe of products. þ Marketing develops sophisticated models to forecast sales volumes and continually debates the wisdom of adding new variants and dropping old ones. þ Product designers may work on many different incremental designs at the same time. þ Organizational learning occurs many through the sharing of technical ideas among the designers and makers of similar products. We identified that, our production department is efficient enough to meet our domestic demand and also can produce excess units, which is needed to sell. The company is ready to face the competitive environment. Districts attractiveness is generally measured by using market size, market growth rate, number and type of competitors, governmental regulations as well as economic & political stability. 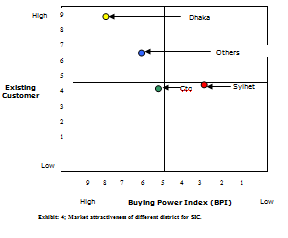 However, we used BPI (buying power index) to identify the market attractiveness of adjacent (major districts of Bangladesh) we also considered the customer intensity as the 2nd dimension. R = the number of bottle purchase. C = Numbers of customer who purchase in cash. P= the number of customer in different district who are regular buyer. The researcher assigned value to different attributes on the basis of their relative importance to Sayma Enterprise. 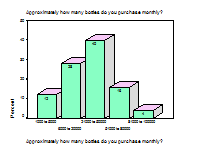 The number of bottle purchase receives a value of 3, number of customer who purchases in cash a value weighted of 5 & the number of customer in different districts who are regular buyer a weight of 2. The second dimension of the scale indicates the total number of customers currently existing in the three given districts. According to Sayma Enterprise, it has as many as 90 customers in Dhaka, 40 in Chittagong ,25 customers in Sylhet and 60 customer in other districts. Pharmaceuticals manufacturers – Pharmaceuticals pet bottles. Chocolate, cream, beverage, juices, tea, nuts, jam, pickle, mayonnaise, coffee manufacturers – pet bottles and jars. Minerals water producer – 20 litter bottles. From the above exhibit, we tried to show three factors influence us to choose pharmaceuticals companies as our target market. 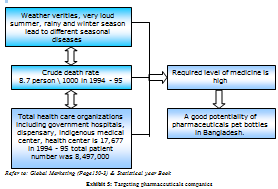 The loud seasonal variation in Bangladesh makes the people vulnerable to various seasonal diseases. The crude death rate was 8.7 person \ 1000 people and annually about 8,497,000 were being treated in the 17,677 in different health facilities. Therefore, it is a good potential market for our pharmaceuticals pet bottles. From the above exhibit, we can see a good number of tourist visit Bangladesh every year. People have a high health consciousness in Bangladesh and good water sources can make it feasible to sales mineral water container. Good sources of river can also help the producer of mineral water make treatment plant of mineral water and produce mineral water not only at a reasonable cost but also conveniently. 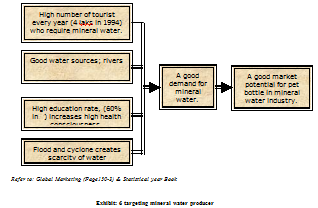 Higher education rate indicates that more health consciousness among the people of Bangladesh that can generate interest to use mineral water. Bangladesh produces oil seeds. It also imports a reasonable quantity of oil every year. Importers can import oil in large container and use our container to market it. The hot summer, health consciousness and disposable income is making the beverage market a prospective one. Before reading on, stop for moment and think about how you would define marketing. Marketing is often viewed in terms of individual activities that constitute the overall marketing process. One popular conception of marketing is that it primarily involves sales. Other perspective view marketing as consisting primarily of advertising or retailing activities. For some market research, pricing, or product planning may have come to mind. Marketing facilitates the exchange process by carefully examining the needs and wants of consumers, developing a product or product or service that satisfies these needs, offering it at a certain price, making it available through a particular place or channel of distribution, and developing a program of promotion of communication to create awareness and interest. These four Ps-product, price, place (distribution), and promotion-are elements of the marketing mix. The basic task of marketing is combining these four elements into a marketing program to facilitate the potential for exchange with consumers in the marketplace. 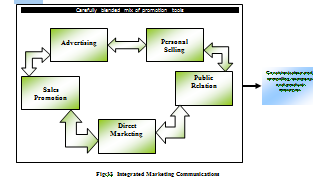 Promotion has been defined as the coordination of all seller-initiated efforts to set up channels of information and persuasion to sell goods and services or promote an idea.13 while implicit communication occurs through the various elements of the marketing mix, most of an organization’s communications with the marketplace take place in a carefully planned and controlled promotional program. The basic tools used to accomplish an organization’s communication objectives are often referred to as the promotional mix and include advertising, direct marketing, sales promotion, publicity/public relations, and personal selling. Advertising: Any paid form of non-personal presentation and promotion of ideas, goods or services by an identified sponsor. Personal selling personal: presentation by the firm’s sales force for the purpose of making sales and building customer relationships. Sales promotion: Short –term incentive to encourage the purchase or sale of product or service. Public relations: Building good relations with the company’s various publics by obtaining favorable publicity, building up a good corporate image, and handling or heading off unfavorable rumors, stories, and events. Direct marketing: Direct Connections with carefully targeted individual consumers to both obtain an immediate response and cultivate lasting customer relationships- the use of telephone, mail, fax, e-mail, the Internet, and other tools to communicate directly with specific consumers. Each category involves specific tools. For example, advertising includes print, broadcast, outdoor, and other forms, Personal selling includes sales presentations, trade shows, and incentive programs. Sales promotion includes point-of-purchase displays, premiums, discounts, coupons, specialty advertising, and demonstrations. Direct marketing includes catalogs, telemarketing, fax, kiosks, the Internet, and more. Thanks to technological breakthroughs, people can now communicate through traditional media (newspapers, radio, telephone, television), as well as through newer media forms (fax machines, cellular phones, pagers, and computers). The new technologies have encouraged more companies to move from mass communication to more targeted communication and one-to-one dialogue. At the same time, communication goes beyond these specific promotion tools. The product’s design, its price, the shape and color of its package, and the stores that sell it-all communicate something to buyers. Thus, although the promotion mix is the company’s primary communication activity. the entire marketing mix-promotion and product, price, and place-must be coordinated for the greatest communication impact. To communicate effectively, marketers need to understand how communication works. Communication involves the nine elements shown in Two of these elements are the major parties in a communication the sender and the receiver. Another two are the major communications tools the message and the media. Four more are major communication functions-encoding, decoding, response, and feedback. The last element in noise in the system. Definitions of these elements follow and are applied to an ad for Hewlett-Packard color copiers. Sender: The party sending the message to another party-here, HP. Encoding: The process of putting thought into symbolic form-HP’s advertising agency assembles words and illustrations into an advertisement that will convey the intended message. Message: The set of symbols that the sender transmits-the actual HP copier ad. Media: The communication channels through which to message moves from sender to reviver-in this case, the specific magazines that HP selects. Decoding: the process by which the receiver assigns meaning to the symbols encoded by the sender-a consumer reads the HP copier ad and interprets the words and illustrations it contains. Receiver: The party receiving the message sent by another party-the home office or business customer who reads the HP copier ad. Response : The reactions of the receiver after being exposed to the message-any of hundreds of possible responses, such as the consumer is more aware of the attributes of HP copiers, actually buys an HP copier, or does nothing. Feedback : The part of the receiver’s response communicated back to the sender-HP research shows that consumers are struck by and remember the ad, or consumers write or call HP praising or criticizing the ad or Hp’s products. Noise: The unplanned static or distortion during the communication process, which results in the receiver’s getting a different message than the one the sender sent-the consumer it distracted while reading the magazine and misses the HP ad or its key points. Advertising can reach masses of geographically dispersed buyers at a low cost per exposure, and it enables the seller to repeat a message many times. For example, television advertising can reach huge audiences. Beyond its reach, large-scale advertising says something positive about the seller’s size, popularity, and success. Because of advertising’s public nature, consumers tend to view advertised products as more legitimate. Advertising is also very expressive-it allows the company to dramatize its through the artful use of visuals, print, sound, and colour. On the one hand, advertising can be used to build up a long-term image for a product On the other hand, advertising can trigger quick sales. Magazines and newspapers are difficult media to employ for direct marketing. Because these ads have to compete with the clutter of other ads, and because the cost of the space is relatively expensive, response rates and profits may be lower than in other media. The role of magazines and newspapers in the advertiser’s media plan differs from that of the broadcast media because they allow the allow the presentation of detailed information that can be processed at the reader’s own pace. The print media are not intrusive like radio and TV, and they generally require some effort on the part of the reader for the advertising message to have an impact. For this reason, newspapers and magazines are often referred to as high-involvement media. Over the past several decades, magazines have grown rapidly to serve the educational, informational, and entertainment needs of a wide range f readers in both the consumer and business markets. Magazines are the most specialized of all advertising media. While some magazines-such as Reader’s Digest, Time, and TV Guide-are general mass-appeal publication, most are targeted to a very specific audience. There is a magazine designed to appeal to nearly every type of consumer in terms of demographics, lifestyle, activities, interests, or fascination. Numerous magazines are targeted toward specific businesses and industries as well as toward individuals engaged in various professions. 1.Magazine directed at specific professional group, such as Nation Law Review for lawyers and Architectural Forum for architects. 2.Industrial magazines direct to businesspeople in various manufacturing and production industries. 3.Trade magazines targeted to wholesalers, dealers, distributors, and industrial Engineering. 4.General business magazines aimed at executives in all areas of business such as Forbes, Fortune, and Business Week. Newspapers, the second major form of print media, are the largest of all advertising media in terms of total dollar volume. Newspapers are an especially important advertising medium to local advertisers, particulars to retailers. However, newspapers are also valued to national advertisers. Many of the advertising dollars spent by local retailers are actually provided by national advertisers through cooperative advertising programs. Newspapers very in terms of their role as an advertising medium. as to supply other information and features that appeal to readers. The vast majority of newspapers are daily publications serving a local community. However, weekly, national, and special-audience newspapers have special characteristics that can be valuable to advertisers. Daily newspapers, which are published each weekday, are found in cities and larger towns across the country. Many areas have more than one daily one daily paper. They provide detailed coverage of news, events and issues concerning the local area as well as business, sports, and other relevant information and entertainment. Most weekly newspapers originate in small towns or suburbs where the volume of news and advertising cannot support a daily newspaper. These papers focus primarily on news, sports, and events relevant to the local area and usually ignore national and world news, sports, and financial and business news. Weeklies appeal primarily to local advertisers because of their geographic focus and lower absolute cost. Most national advertisers avoid weekly newspapers because of their duplicate circulation with daily or Sunday papers in the large metropolitan areas and problems in contracting for and placing ads in these publications. Display advertising is found throughout the newspaper and generally uses illustrations, headlines, white space, and other visual devices in addition to the copy text. Display ads account for approximately 70 percent of the advertising revenue of the average newspaper. The two types of display advertising in newspapers are local and national (general). Local advertising refers to ads placed by local organizations, business, and individuals who want to communicate in the market area served by the newspaper. Local advertising comes primarily from retailers. Supermarkets and department stores are among the leading local display advertisers, along with numerous other retailers and service operations such as banks and travel agents. Local advertising is sometimes referred to as retail advertising because retailers account for 85 percent of local display ads. Personal selling involves selling through a person to person communications process. The emphasis placed on personal selling varies from firm to firm depending on a variety of factors, including the nature of the product or service being marketed, size of the organization, and type of industry. Personal selling often plays the dominant role in industrial firms, while in other firms, such as low-priced consumer non-durable goods firms, its role is minimized. In many industries, these roles are changing to a more balanced use of promotional program elements. In an integrated marketing communication program, personal selling is used as a partner with, not a substitute for, the other promotional mix elements. What specific information must be exchanged between the firm and potential customers? What are the alternative ways to carry out these communication objectives? How effective is each alternative in carrying out the needed exchange? How cost effective is each alternative? A Company can divide up sales responsibilities along any of several lines. The decisions simple if the company sells only one product line to one industry with customers in many locations. In that case the company would use a territorial sales force structure. However, if the company sells many products to many types of customers, it might need either a product sales force structure, a customer sales force structure, or a combination of the two. Once the company has set its structure, it is ready to consider sales force size. Salespeople constitute one of the company’s most productive-and most expensive-assets. Therefore, increasing their number will increase both sales and costs. Many companies used to send their new salespeople into the field almost immediately after hiring them. They would be given samples, order books, and general instructions (“sell west of the Mississippi”). To many companies, a training program translated into high expense for instructors, materials, space, and salary for a person who was not yet selling, and a loss of sales opportunities because the person was not in the field. Most companies take a customer-oriented approach to personal selling. They train sales-people to identify customer needs and to find solutions. This approach assumes that customer needs provide sales opportunities, that customers appreciate good suggestions, and that customers will be loyal to salespeople fits better with the marketing concept than does a hard-sell salesperson or the glad-handing extrovert. Buyers today want solutions, not smiles, results, not razzle-dazzle. They want salespeople who listen to their concerns, understand their needs, and respond with the right products and services. Most training programs view the Selling Process as consisting of several steps that the salesperson must master (see Figure 16.3). These steps focus on the goal of getting new customers and obtaining orders from them. However, most salespeople spend much of their time maintaining existing accounts and building long-term customer relationships. We discuss the relationship aspect of the personal selling process in a later section. Sales and Marketing Management uses three categories to classify salespeople; order taking, creative selling, and missionary sales. Of course, not all firms treat each of these responsibilities the same, nor their salespeople limited to only these tasks. Personal selling has evolved additional responsibilities beyond these Job Requirement may include 1. Locating prospective customers; 2. determining customer’s needs and wants that are not being satisfied. 3. recommending a means of satisfying these needs and/or wants; 4. demonstrating the capabilities of the firm and its products for providing this satisfaction; 5. Closing the sale and taking the order; and 6. following up and servicing the account. Sales promotion includes a wide assortment of tools-coupons, contests, cents-off deals, premiums, and others-all of which have many unique qualities. They attract consumer attention, offer strong incentives to purchase, and can be used to dramatize products offers and to boost sagging sales. Sales promotions invite and reward quick response-whereas advertising says, “Buy our product,” sales promotion says, “Buy it now”. Sales promotion effects are often short lived, however, and often are not as effective as advertising or personal selling in building long-run brand preference. First, sales promotion involves some type of inducement the provides an extra incentive to buy. This incentive is usually the key element in a promotional program; it may be a coupon or price reduction, the opportunity to enter a contest of sweepstakes, a money back refund or rebate, or an extra amount of a product. Sales promotion can also provide an inducement to marketing intermediaries such as wholesalers and retailers. A trade allowance or discount provides retailers with a financial incentive to stock and promote a manufacturer’s products. 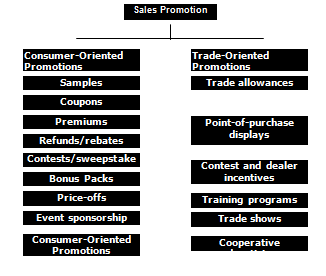 A second point regarding sales promotion is that it is essentially an acceleration tool, designed to speed up the selling process and maximize sales volume.By providing an extra incentive, sales promotion techniques can motivate consumers to purchase a larger quantity of a brand or shorten the purchase cycle of the trade or consumers by encouraging them to take more immediate action. One basic decision the sales promotion or brand manager must make concerns the method by which the sample will be distributed. The sampling method chosen is important not only in terms of costs but also in terms of influencing the type of consumer who receives the sample. The best sampling method gets the products to the best prospects for trail and subsequent repurchase. Some basic distribution methods include door-to-door, direct mail, in-store, and on-package approaches. Door-to-door sampling, in which the sample is delivered directly to the prospect’s residence, is used when it is important to control where the samples are delivered. While virtually any type of product samples can be delivered this ways, this method is on the decline because of the labor expense involved. Premiums are a sales promotion device used by many marketers. A premium is a offer of an item of merchandise or service either free or at a low price that is used as an extra incentive for purchasers. Many marketers are eliminative toys and gimmicks in favor of value –added premiums that reflect the quality of the product and are consistent with its image and positioning in the market. Another consumer-oriented promotion technique is the direct price-off deal, which reduces the price of the brand. Price-off reductions are typically offered right on the package through specially marked price packs. Probably the most common trade promotion is some form of trade allowance, a discount or deal offered to retailers or wholesalers to encourage them to stock, promote, or display the manufacturer’s products. Types of allowances offered to retailers include buying allowances, promotional or display allowances, and slotting allowances. A buying allowance is a deal or discount offered to resellers in the form of a price reduction on merchandise ordered during a fixed period. These discounts are often in the form of an off-invoice allowance, which means a certain per-case amount or percentage is deducted from the invoice. A buying allowance can also take he form of free goods; the reseller gets extra cases with the purchase of specific amounts. Manufacturers often give retailers allowances or discounts for performing certain promotional or merchandising activities in support of their brands. Sometimes referred to as merchandising allowances, they can be given for providing special displays away from the product’s regular shelf position, running in-store promotional programs, or including the product in an ad. The manufacturer generally has guidelines or a contract specifying the activity to be performed to qualify for the promotional allowance. The allowance is usually as a fixed amount per case or a percentage deduction from the list price for merchandise ordered during the promotional periods. Another important promotional activity targeted to resellers is the trade show, a form where manufacturers can display their products to current as well as prospective buyers. In many industries, trade shows are a major opportunity to display one’s product lines and interact with customers. Important management personnel often attend them from large retail chains as well as by distributors and other reseller representative. Public relations is very believable-news stories, features, and events seem more real and believable to readers than ads do. Public relations can also reach many prospects who avoid salespeople and advertisements-the message gets to the buyers as “news” rather than as a sales-directed communications. As with advertising, public relations can dramatize a company or product. Marketers tend to under use public relations can dramatize a company or product. Marketers tend to undersea public relations campaign used with other promotion mix elements can be very effective and economical. The actual process of conducting public relations and integrating it into the promotional mix involves a series of both traditional and marketing oriented tasks. It tells management what has been achieved through public relations activities. It provides management with a quantitative means of measuring public relations achievement. It gives management a way to judge the quality of public relations achievements and activities. Although there are many forms of direct marketing- telemarketing, direct mail, electronic marketing, online marketing, and other- they all share four distinctive characteristics. Direct marketing is nonpublic: The message is normally addressed to a specific person. Direct marketing also is immediate and customized: Messages can be prepared very quickly, and they can be tailored to appeal to specific consumers. Finally, direct marketing is interactive : It allows a dialogue between the marketing and the consumer. and messages can be altered depending on the consumer’s response. Thus, direct marketing is well suited to highly targeted marketing efforts and to building one-to-one customer relationships. Direct mail is often called junk mail-the unsolicited mail you find in your mailbox. While many advertisers shied away from direct mail in the past, fearful of the image it might create or harboring the belief that direct mail was useful only for low-cost products, this is no longer the case. Keys to the success of direct mail are the mailing list, which constitutes the database from which names are generated, and the ability to segment markets. Lists have become more current and more selective, eliminating waste coverage. Marketing conducted through interactive online computer systems, which link consumers with sellers electronically. Service that offer online information and marketing services to subscribers who pay a monthly fee. The vast and burgeoning global web of computer networks with no central management or ownership. The user-friendly Internet accesses standard. Today, even novices can surf the Internet and experience fully integrated text, graphics, images, and sound. User can send e-mail, exchange views, shop for products, and access news, food recipes, art and business information. If you have a telephone, you probably do not have to be told about the rapid increase in the use of telemarketing, or sales by telephone. 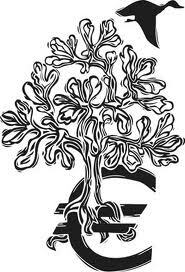 Both profit and charitable organizations have employed this medium effectively in both one and two-step approaches. As telemarketing continues to expand in scope, a new dimension referred to as audiotex or telemedia has evolved. 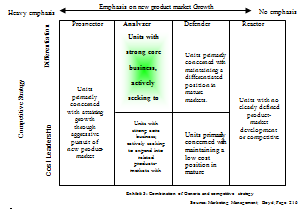 Dividing a market into distinct groups of Bayer with different needs, characteristic, or behavior who might require separate products or marketing mixes. 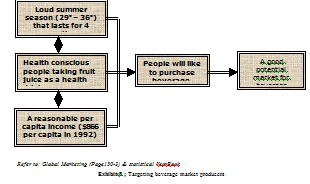 The process of evaluating each market segment’s attractiveness and selecting one or more segments to enter. 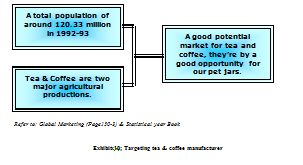 Formulating competitive positioning for a product and detailed marketing mix. Internal analysis to identify the company’s Strength, Weakness, Opportunity and threat. 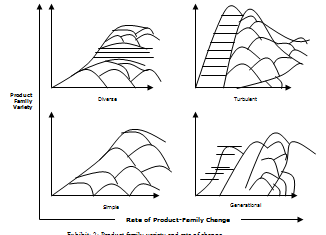 The shape of the product family life cycle will vary greatly from one product family to another. Juxtaposing model variety rate of model change yields four distinct patterns that reflect a firm’s competitive reaction to internal drives and external forces, particularly those exerted by markets, the introduction of new technologies, and the actions of competitors. Beyond the competitive patterns within individual product families, companies have a larger opportunity to develop multiple product families simultaneously. 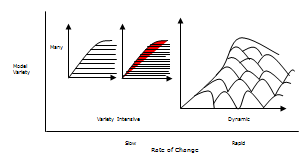 These, too, can be plotted in terms of variety and rate of change. All the organizations that buy goods and services for use in the production of other products and services or for the purpose of reselling or renting them to others at a profit. The decision making process by which business buyers establish the need for purchased products and services and identify, evaluate, and choose among alternative brands and suppliers. þ Business markets contain fewer but larger buyers. Our potential market includes the owners of the hundreds of mineral water, fruit juice, different medicine, oil, chocolate, tennis ball, facial cream, spices, tea and jam manufactures. But our fate in the business market depends on getting orders from one of only a few of the large manufactures. þ Business customers are more geographically concentrated. Our business buyers are geographically concentrated in the industrial areas. þ Business buyer demand is derived from final consumer demand. 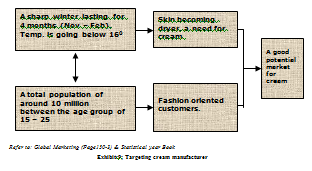 A facial cream manufactures will buy our product because consumers buy cream. þ Demand in many business markets is more inelastic – not affected as much in the short run by price changes. A drop in the price of our container will not cause a tea, mineral water or facial cream manufactures to buy much more of pet bottles. þ Business purchases involve more buyers. The business buying of our bottles will probably be done by trained purchasing agent. Since our intended product is a major component of the related industries, buying committees made up of technical experts and top management are common in the buying process. þ The business buying process is more formalized. Importers from Myanmar will call for detail product specifications, written purchase orders, careful searches about us (supplier) and formal approval. From the factors stated above we can decide about segmenting and targeting our market. A social and managerial process by which individuals and groups obtain what they need want through creating and exchanging products and values with others. A promotion strategy that calls for spending a lot on advertising and consumer promotion to build up the consumer demand. If the strategy is successful, consumers will ask their retailers for the product, the retailers will ask the wholesalers, and the wholesalers will ask the producers. A promotion strategy that calls for using the sales force and trade promotion to push the product through channels. The producer promotes the product to the wholesalers, the wholesalers to retailers, and the retailers promote to consumers. 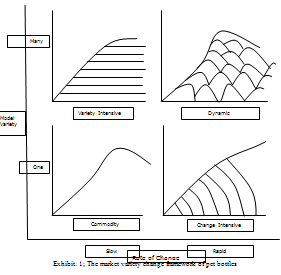 The model variety- change framework yields four distinct patterns that reflect a firm’s competitive reaction to internal drives and external forces, particularly those exerted by markets, the introduction of new technologies and the actions of competitors. 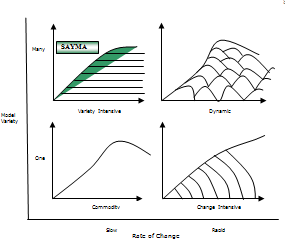 The four patterns include Variety-Intensive, Dynamic, Commodity and Change Intensive. Distribution or place includes company activities that make the product available to target consumers. The activities of designing and producing the container or wrapper for a product. Traditionally, the primary function of the package was to contain and protect the product. In recent years, product safety has also become a major packaging concern. Anything that can be offered to a market for attention, acquisition, use or consumption that might satisfy a want or need. It includes physical objects, services, persons, places, organizations, and ideas. The tasks involved in planning, implementing, and controlling the physical flow of materials, final goods and related information from points of origin to points of consumption to meet customer requirements at a profit. Promotion means activities that communicate the merits of the product and persuade target customers to buy it. Brand Loyalty, long a central construct in Marketing, is a measure of the attachment that a customer has to a brand. It reflects how likely a customer will be to switch to another brand, especially when that brand makes a change, either in price or in product features. Brand awareness is the ability of a potential buyer to recognize or recall that a brand is a member of a certain product category. A link between product class and brand is involved. The total of 25 industrial buyer interviewed in the survey. Among them 68% buyer purchased Pet bottles, 20% buyer purchased pet jar and 12% industrial buyer purchased 20 liter container. It is seen that, PET bottles’s consumer is higher than other product of SIC. That means, SIC PET bottles is better quality than other products line. Of the total interviewed 25 industrial buyer 48% buyer purchased pet product for filling oil, 24% purchaser for filling water, 8% purchaser for filling chocolate,4% purchaser for filling juice, 12% purchaser for filling spices and 4% purchaser for filling medicine. As there is 48% respondent opined there opinion in favor of filling oil. So, it is assumed that, there is a potential oil industry for SIC pet bottles. Of the total interviewed 25 industrial buyer 36% buyers positioned order through telephone, 4% buyers positioned order through fax, 20% buyers positioned order by coming physically, 40% buyers positioned order Through sales force. As maximum order is placed through sales force, it means SIC sales force is efficient. Of the total interviewed 25 industrial buyer 40% buyers purchased 50000 units monthly, 28% buyers purchased 20000 units monthly,16% buyers purchased 80000 units monthly,12% buyers purchased 5000 units monthly and 4% buyers purchased 100000 units monthly. It means SIC’s segment is 21000 to 50000 bottles. Of the total interviewed 25 industrial buyer 52% buyers place order once in a month, 24% buyers place order twice in a month, 16% buyers place order twice in a week, 8% buyers place order once in a week. It means all the regular customer of SIC plays order once in a month. Of the total interviewed 25 industrial buyer 64% buyers place order in advance and 36% buyers place order sooner or later. Major customers like to place order in advance as it covers 64% of the total respondents. So the finding is, SIC customer feels comfort in giving advance order. Of the total interviewed 25 industrial buyer only 16 said yes, among them 56% said SIC sales force always fulfill their demand, 31% said SIC sales force sometime fulfill their demand and 13% said SIC sales force never fulfill their demand. So, sales force is efficient enough to meet the advance demand. Of the total interviewed 25 industrial buyers 40% buyers said SIC price is neither high neither low, 32% buyers said SIC price is high, 12% buyers said SIC price is very high, 12% buyers said SIC price is low and 4% buyers said SIC price is very low. So, it can be said that, customers are partially satisfied with the price of the product. Of the total interviewed 25 industrial buyers 32% buyers like design verity, 20% buyers like Transport facility, 16% buyers like low price option, 16% buyers like discount option, 12% buyers like credit facility, 4% buyers like commission option. 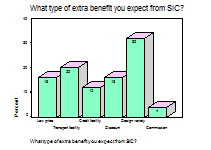 Customers expect that, design variety is the maximum benefit they may expect from SIC. Of the total interviewed 25 industrial buyers 36% said sending sales force to the customer, 24% said advertising and Free sample for testing, 12% said discount and 4% said others. Customer expect the sales force to carry the new design product to the customer. Of the total interviewed 25 industrial buyer 72% said no and 28% said yes. It is realized that, SIC did not display any effective advertisement before. Of the total interviewed 25 industrial buyer 28% buyers have seen the advertisement and among them 57% through Billboard or banner, 29% through newspaper, 14% through Magazine.Most of the customers had seen billboard which is in the stadium area. Of the total interviewed 25 industrial buyer 32% buyer like advertisement to know about the available product, 28% buyer like to know what new in the market, 12% to know availability of the product, 45 to know about configuration of the product. 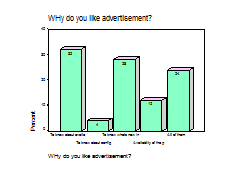 Most of the customer said they preferred advertisement to know the available product in the market. 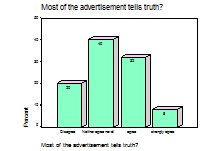 Of the total interviewed 25 industrial buyer 40% buyers neither agree nor disagree about relevance of advertisement regarding telling the truth, 32% agree and 20% disagree & 8% strongly agree about the statement “ most of the advertisement tells truth”. Of the total interviewed 25 industrial buyer 48% buyers confess regarding Advertise helps people to buy best product or service for them, 32% said somewhat true, 12% said not very true, 4% said very true, 4% said not true at all. 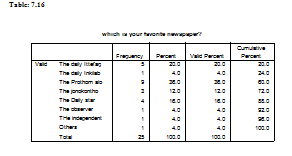 Of the total interviewed 25 industrial buyer 36% favored The Prothom Alo, 20% favored The daily ittefaq, 16% preferred Daily star. 12% preferred the jonokontho, 4% the The Daily star, 1% preferred the observer,1% preferred the Independent. If SIC wants to do promotional activities and want to publish advertising they should go to The Prothom Alo. Of the total interviewed 25 industrial buyer 36% buyer said about credit facility, 24% said about Advertising, 20% said change the cap design, 12% about discount, 8% about design variety. Customers suggested that, in order to increase turnover credit facility should be relaxed. Of the total interviewed 25 industrial buyer 44% said about 25% credit facility, 24% said 50% credit facility, 16% said 100% credit facility, 12% said credit against security, 4 % said others. Most of the customer wanted 25% credit facility. Of the total interviewed 25 industrial buyer 44% said low price, 28% said durability of the cap, 12% said design variety, 8% said better service, 4% said more effective sales force and grip ability to the bottle. Here we have seen that, customer will only switch for high price. Because they are very price sensitive. 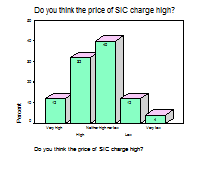 But the customers are satisfied with SIC’s overall performance. Of the total interviewed 25 industrial buyer 40% said about gentle, 20% said very gentle, 16% said neither harsh and somewhat gentle,8% said somewhat harsh. It is seen that, most of the customer are satisfied with SIC’s sales force. Entire of my project study is dependent on some propositions. Before designing questionnaire, I developed some propositions. My entire questionnaire is fully depending on that hypothesis. Proposition result could be positive or negative. For justifying Proposition, I used all collected primary data which are relevant to particular propositions. The source of primary data came from questionnaire survey and exclusive interview. 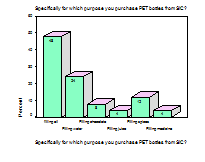 From the above cross tabulation I have found that, the maximum respondent gave their opinion on having some extra benefit- therefore demanding more design variants in case of purchasing PET bottle for filling oil, juice and spices. The design variety option of Sayma Enterprise needs to be very strong. They have 40 different designs of bottles. But customers want more design variety. So, here we see the intersect points shows the highest value i.e. 16% which means customer needs more new design, size, shape, transparency, outlook, cap design, grip ability. Beside this, customer desires to have different features of PET bottles. SIC have potential customers who are involved in the oil manufacturing industry, juice, mineral water and spices industry. These potential customer group feels that, Sayma Enterprise lacks the design options that will enable them to choose from different alternatives. So, the satisfaction level regarding the features and design is not fulfilled. So, this Proposition is false. Here the result of my Proposition is negative. From the above cross tabulation, I have found that, 60% of customer purchase huge number of bottles (Considering those customers who purchase more than 21,000 bottles) and among them 60% (9*100/15) of customer said they have never seen advertisement of SIC. SIC had a perceived idea that, their advertisement was effective to attract customer. 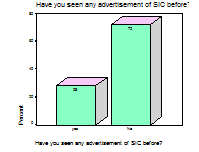 However the result indicates that, the advertisement of SIC was not effective enough to attract people. The most influential customer group of SIC are getting company information from sources other than advertising. So, the perceived knowledge of SIC regarding the advertising quality and media selection is not correct. So, this Proposition is false. Here the result of my Proposition is negative. From the above cross tabulation, I have found that, 44% customer expects extra benefit like design variety, but in our Proposition I said that, only 100% credit facility holder deserves extra benefit- design variety. As we can see from the above findings, SIC customers are financially solvent who don’t need maximum credit facility. Rather, most of the customer needs extra benefit but they are not interested in extreme credit facilities (maximum customers will like to get 25% credit facilities). These customer prefers extra benefit like transportation facilities and to lower the price of products. So, this Proposition is false. Here the result of my Proposition is negative. The researcher considered those customers as price sensitive who consider Sayma Enterprise charges too much price to those who ranked Sayma Enterprise’s products price as neither high nor low. More than 88% of the customers who are price sensitive have mentioned that the sales force of Sayma Enterprise always meet their order promptly (8*100/9). Hence, the above proposition is true. So, the sales personnel of Sayma Enterprise is capable enough to satisfy the price conscious customers. To promote SIC product among all the media source newspaper will be most effective media for the customer who place order regularly. The researcher considers those customers as most regular who place order once or twice in a week. Among these six customers, none has recommended that, advertising is an effective promotional activity for promoting new product. Most of the customers said, sending sales force and free samples should be more effective to launch new design product. So, this Proposition is false. Here the result of my Proposition is negative. This demonstrates the fact that, media advertising plays a very small role in selling industrial products like pet bottles. From the above cross tabulation, I have found that,45% of the customers who consider Sayma Enterprise charges high or a very high price will switch to other brand only if that particular brand offers a lower price (5*100/11). This is a reasonable figure considering the fact that the researcher had offered the respondents as many as seven options. However, neither of the customers who consider Sayma Enterprise’s prices as low nor very low has mentioned that price will be a factor that will motivate him/ her to switch the brand. So, the above mentioned proposition is partially true. People who order through sales force also place order in advance. 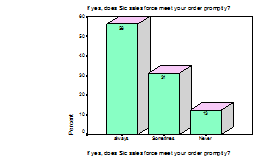 Out of the 10 total respondents who place orders through sales force, 7 place orders in advance, which is 70% of the total number. Here the result of my Proposition is positive. SIC believes marketing as the process of planning and executing the conception, pricing, promotion, and distribution of ideas, goods and services to create exchanges that satisfy individual and organizational objectives. SIC bears the coordination of all seller-initiated efforts to set up channels of information and persuasion to sell its PET product. While implicit communication occurs through the various elements of the marketing mix, SIC communicates with the marketplace in a carefully planned and controlled promotional program. The basic tools used to accomplish SIC’s communication objectives are often referred to as the promotional mix and include advertising, direct marketing, sales promotion, public relations, and personal selling. As SIC itself is very much conscious about the modern up-to-dates and company has a grateful attitude to technological breakthroughs, people can now communicate through traditional media (newspapers, telephone), as well as through newer media forms (fax machines, cellular phones, pagers, and computers). The new technologies have encouraged SIC to move from mass communication to more targeted communication and one-to-one dialogue. For example, advertising includes print, outdoor, and other forms, Personal selling includes sales presentations, trade shows, and incentive programs. Sales promotion includes point-of-purchase displays, premiums, discounts, coupons, specialty advertising, and demonstrations. Direct marketing includes catalogs, telemarketing, facsimile transmission, the Internet, and more. 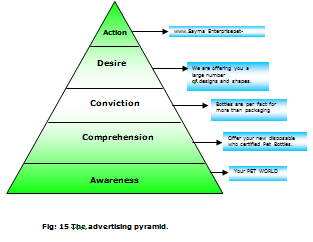 Advertising and promotion are an integral part of our social and economic systems. In our complex society, advertising has evolved into a vital communication system for both consumers and businesses. The ability of advertising and other promotional methods to deliver carefully prepared messages to target audiences has given them a major role in the marketing programs of most organizations. Advertising can reach masses of geographically dispersed buyers at a low cost per exposure, and it enables the seller to repeat a message many times. For example, newspaper, magazines, yellow page’s advertising can reach huge audiences. From SIC’s previous experience, it is seen that when the advertisement is printed in newspaper, its sales normally blooms. Beyond its reach, large-scale advertising says something positive about the seller’s size, popularity, and success. Because of advertising’s public nature, consumers tend to view advertised products as more legitimate. Normally, industrial advertisement is not published in the newspaper. Advertisement normally published in yellow pages, business magazine and different government/private official magazine. As the company desires to develop advertisement in the newspaper advertisement, I have developed a newspaper advertisement and its related work which includes creating messages, different attractive offers, color management, design management and so on. News paper and print media has become comparative advertising, in which SIC should directly or indirectly compares its brand with one or more other brands. Comparative advertising should be used for products such as mineral water, oil, juice, different types of spices & chocolate and so on. 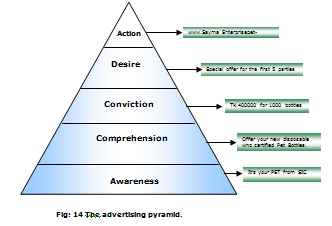 This advertisement is based on below shown advertising pyramid. I have developed two types of advertising. One for general customers and another for corporate customer. My first advertisement is focusing the all types of buyer who may become potential buyer of SIC. It created a brand image for SIC’s existing customer and potential customer. Basically it will be a newspaper advertisement. Though we know industrial goods, newspaper advertising is not effective enough to increase the number of customer, SIC decided to publish a newspaper advertisement in renown newspapers. 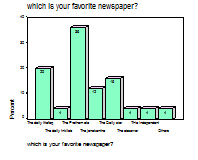 In my survey I found that, Prothom ALO is the most favorite newspaper of the customer. So, I will recommend SIC to publish the advertisement in the Prothom ALO. Visual: Pictures of four pet products. Sub-Head: “Offers you New Disposable, who certified Pet bottles”. Body copy: 400000, special offer for 1000pcs bottles. Action: Order now (phone, e-mail, mail). First of all we should make our customers aware about the brand. Customer will be awared by the brand and product name by the headline It’s your Pet. After becoming aware customers should know about some special or unique feature of the product. SIC pet product are certified by WHO. This may influence our customer who will sell food items specially liquid by using the bottles or containers. More specifically buyers of SIC can get some competitive advantage on basis of this feature of SIC. Customers conviction will come if they some thing about the price of this brand tk 400000 special offer for 1000pcs. It will also give the customers an opportunity to compare the price with other producers of PET. If our customers find that SIC has offered something special for them there might be desire to go for that right now. If we grow only desire among the minds of our customers that won’t be enough. Customer will look for the way to place order or know more. We have to give proper opportunity to take action Order now(phone.. email..) by our customers. Most of our customers will place order by Telephone (ref: graphical analysis). So, few easily callable phone no. is provided as well as the mailing address and email and web side address also. My second advertisement is for corporate image. Corporate image is related with the company’s brand promotion. Corporate advertising is not a traditional advertisement. There will be some extra features which will not resemble with the traditional advertisement. This type of advertisement is effective in the diplomatic zone. Like Sheraton or Sonar gaon lobby. So, I will recommend SIC to display this advertisement in such places. Visual: Beautyful Pictures of pet products. Sub-Head: “We are offering you a large number of designs and shapes.”. Body copy: Bottles are per fact for more than packaging. First of all I should make our corporate customers aware about the brand. Customer will be aware by the brand and product name by the headline Your Pet world. After becoming aware customers should know about some special or unique feature of the product. SIC pet product are certified by WHO. This may influence our corporate image. More specifically buyers of SIC can get some competitive advantage on basis of this feature of SIC. Customers conviction will come if they some thing about the price of this brand Bottles are per fact for more than packaging. It will also give the customers an opportunity to compare our product with other producers of PET. If our customers find that SIC has offered something special for them there might be desire to go for that right now. Customer will look for the way to place order or know more. We have to give proper opportunity to take action www.Sayma Enterprisepetbottle.com(phone.. email..) by our customers. Most of our customers will place order by Telephone (ref: graphical anlysis). So, few easily callable phone no. is provided as well as the mailing address and email and web side address also. At last I can say both newspaper and corporate advertising will help SIC to increase is sale and create a good corporate image. Form the survey I have found that(cross tab no.2. page:97,98) the previous advertisement was not effect to create an impact in customer mind. My 2nd hypothesis was “The existing advertisements are effective enough to influence customer who buy large number of bottles”. 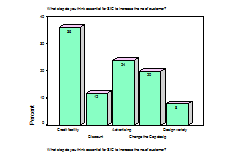 That became false because 72% of customer said they never see advertisement of SIC. So I think if SIC use these advertisement in correct media they will be successful this time. SIC believes personal selling is typically under the control of the sales manager, not the advertising and promotions department. But personal selling should make a valuable contribution to the promotional program. SIC should develop a promotional plan effectively to integrate the roles and responsibilities of its sales force into the communications program. A strong cooperative effort between the departments is also necessary. One of the most imperative element of the SIC promotional mix is personal selling, a form of person-to-person communication in which a seller attempts to assist and/or persuade prospective buyers to purchase SIC’s product or service or to act on an idea. 8.2.1 What should be the SIC’s scope of personal selling? Personal selling should involve selling through a person to person communications process. The emphasis placed on personal selling varies from firm to firm depending on a variety of factors, including the nature of the product or service being marketed, size of the organization, and type of industry. 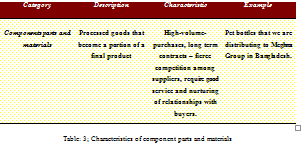 Personal selling often plays the dominant role in industrial firms, while in other firms, such as low-priced consumer non-durable goods firms, its role is minimized. In many industries, these roles are changing to a more balanced use of promotional program elements. In an integrated marketing communication program, personal selling is used as a partner with, not a substitute for, the other promotional mix elements. SIC should developed sales force structure very carefully by considering knowledge, skill, efficiency of the sales forces regarding the significance of each level. 8.2.3.2 Sales Force Size and selecting. Headcount of the sales force should be fixed on the basis of the number of customers in each level and quality should be determined on the significance basis. Beside that SIC can fixed a requirement when they will appoint sales people for different segment. Though training should be given to all sales force properly but quality should be maintained in case of high level customer’s sales force. SIC sales people can follow the above chart to spend their time. Because I have found from proposition 7 (People who order through sales force also place order in advance) that 40% of customer place their order through sales force and they are satisfied with the service of the sales force and for that, they fell comfort to give order to sales force. So if SIC follow this diagram than they will be more benefited and create more effective sales force. Determining customer’s needs and wants that are not being satisfied. Following up and servicing the account. We know that, sales force of SIC is strong. But they become helpless when they go to the customer. As there are different categories of the customer, the sales force of SIC face problem to communicate with them. Because SIC’s product is not portable which makes problem to make display to everyone at everywhere. As they do not carry the product with them, there become a communication gap between sales force and customer regarding right type of the product. Communication gap results faults regarding delivery of the right product. It leads dissatisfaction of the customer. This problem can be minimized by introducing brochure of every product which will be shown to every customer. They can also give brochure to the customer which will do double effect; firstly to collect the right product, to serve advertisement purpose. After doing the market survey it was found that, customer are facing problem regarding the product design as they are a large number of different designed products. It makes confusion among the customer mind. In the data collection process, I have found in the open ended question part that, most of the respondent said they have a lot of problem to select the product. To minimize the problem I had gathered information from engineer department of different product. To develop the brochure I collected some picture from marketing department. I had taken photograph of some pictures for convenience of making the brochure. I designed total brochure using COREL. I had designed the brochure by using data and picture which I was collected from data collection and engineering department. Different kinds of products, pictures and their size, shape, dia, cap size and so on. The information demonstrating the hygienic factors. Offering different industry line to select the right product from the entire product line. The product features of the products which are already in the market to attract existing customer. Different performs variety and their size and shape etc. SIC’s sales promotion should includes a wide assortment of contests, price-off deals, premiums, and others-all of which have many unique qualities. SIC should attract consumer attention, offer strong incentives to purchase, and should use to dramatize products offers and to boost sagging sales. One basic decision the sales promotion or brand manager should make concerns the method by which the sample will be distributed. The sampling method chosen is important not only in terms of costs but also in terms of influencing the type of consumer who receives the sample. SIC should follow the door-to-door sampling, in which the sample is delivered directly to the prospect’s residence, is used when it is important to control where the samples are delivered. Premiums are a sales promotion device used by many marketers. A premium should offer to the item of merchandise or service either free or at a low price that is used as an extra incentive for purchasers. Another consumer-oriented promotion technique is the direct price-off deal, which reduces the price of the different size of the new launched product. Price-off reductions are typically offered right on the package through specially marked price packs. SIC should sponsor some kind of charity-show on children day or environmental day. It will create a huge impact on corporate image of SIC. Beside that it also give some publicity of the brand. SIC should participate in the DITF and CITF for more exposure. They should go for different industrial trade fair. They can display their products to current as well as prospective buyers. Though the participation in the trade fair is relatively expansive but the return is also relatively high. Public relations is very believable-news stories, features, and events seem more real and believable to readers than ads do. SIC’s public relations should reach many prospects who avoid salespeople and advertisements-the message gets to the buyers as “news” rather than as a sales-directed communications. As with advertising, public relations can dramatize a company or product. Marketers tend to under use public relations can dramatize a company or product. Marketers tend to undersea public relations campaign used with other promotion mix elements can be very effective and economical. As SIC’s public relation is not good enough they should think public relations more carefully as it is related with the customer direct interaction. The determination and evaluation of public attitude. The identification of policies and procedures of an organization with a public interest. The development and execution of a communications program designed to bring about public understanding and acceptance. We see that our company is a manufacturing-oriented company, and is placed in the lower left quadrant of the chart below. 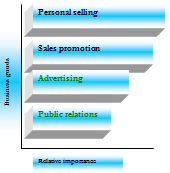 This quadrant is characterized by Weak Public Relations activity with Strong marketing activities. That is, all the elements of the Marketing mix come to play in a manufacturing- oriented company like SIC, with the role of Public Relations, which is a part of the Promotional element of the marketing mix, being the least. The management of SIC recognizes the above, and has followed the theory by the books, correctly. Promotion is a very strong element in the Promotional Mix, and it is rightly said that Promotion is 99% communication and only 1% selling. However, as we find earlier, the element of PR plays a very negligible role in the PromoMix of SIC. ) Albeit, I would like to suggest the following Public Relations campaigns for SIC to implement together with the other four elements of the PromoMix of SIC. The Dhaka International Trade Fair is held once every year. This is a very promising and prospective event under the umbrella of which many companies, big and small, service-oriented and production-oriented, consumer goods and industrial goods, take part in. The number of visitors is hence almost innumerable. Now, what does SIC do in an event where unwanted visitors, or rather visitors who do not fall into SIC’s prospective target population, also come? It has to be taken into consideration that the customer base of SIC is quite small, characteristic of a company selling industrial goods and a manufacturing-oriented one. However, we have to observe that our target visitors are the other participants of the DITF. Of all the participants there must be companies who would surely be in need of bottling and packaging services. Here is where SIC would come in. Apart from the exposure it would get in the DITF, it would also evolve a corporate image for SIC. This would surely be a good reminder to the current clientele of SIC plus an interrogation to the prospects who not yet tried the bottle manufacturing expertise of SIC. Hence I would recommend SIC to participate in the DITF, at least, for the corporate image of SIC. Here, SIC can participate more accurately because the fair would be a convergence of all the manufacturing-oriented companies. This would provide a spacious window for other industrial buyers to look into SIC and its services. SIC can take the opportunity of proclaiming itself on either the World day or Environment Day. The link between SIC and the World/Environment would be the environment and ecologically friendly products that SIC manufactures. This would also show the concern of SIC towards Mother Nature, not to mention the Societal Marketing philosophy that SIC practices. A simple proclamation or a mundane message can be given in newspapers giving felicitations on Environment Day or the World Day. Both current clients and prospects would surely admire this. It would be a positive sign to the current clientele that they are working with an organization that has societal conscience. It would also attract the attention of the hundreds of prospective clients, who have not yet traded with SIC. SIC should give the broader responsibilities of public relations, the issue is how to integrate it into the promotional mix. As SIC’s traditional role or a more marketing-oriented one is assumed, public relations activities are still tied to specific communications objectives. Assessing public attitudes and creating a favorable corporate image is no less important then strategies should design to promote procedures or services directly. SIC should see direct marketing as a system of marketing by which it communicates directly with target customers to generate a response or transaction. This response or transaction may take the form of an inquiry, a purchase, or even a vote. While many advertisers shied away from direct mail in the past, fearful of the image it might create or harboring the belief that direct mail was useful only for low-cost products, SIC should realize that this is no longer the case. I tried to develop web site of SIC which Marketing conducted through interactive online computer systems, which link consumers with sellers electronically. The following three or four pages are the proposed web of SIC through which any customer can make order online. This is a promotional tool which will enhance the transaction rapidity to cope up with the current business need. It is needed for every company to use the fastest media to reach its product to the customer. SIC should not be exception from this. I have developed a web site for SIC PET product to keep phase with this moving trend. The web was developed by through Font Page Express. It is not so much expensive relative to the service it will give. It costs only 12000 taka per year. This proposed web site would be connected with a leasing server to display. At first I had to make home page which was linked with other two pages. Home page contains company profile, the company’ products, order placement facility. Order placement facility is built in the web page. Mainly this web page is demo version and the total web page is under construction. If SIC permits this web page can be developed. Organization profile: Organization profile was developed in order to familiarize SIC to the customer. Here Company’s mission was written and all strategies were opened for all. Objectives of the company, activities and department’s activities are written very clearly in that web page. Order placement facility: The web page will facilitate to take order from the customer online and ensure the rapidity of the service. This order page is connected with a database and database will be updated, as the input will be taken from customer. Displaying company’s product: The web will display all the product of SIC, which will enable customer to choose as per their requirement. As the web will be updated every moment the customer will aware its current offering product. A landmark of using new technology: As making order through email is a modern technology SIC should use that. In this web page I have gathered different products, design variety, design category. Through this page, every customer can have view of the entire product line. Here the products are viewed in such a way so that, utility of that product will clearly realized. 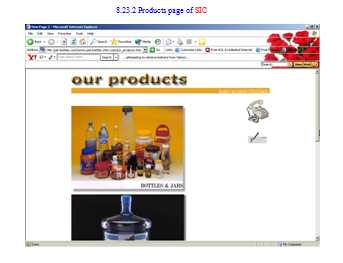 As SIC has a wide range of product line, every product should be displayed in the page. But price of the product can not be displayed as the web can be accessed by every person which may help the competitors to assume SIC’s strategy. Sayma Enterprise Industrial Corporation (SIC) is a product-oriented organization. It seeks to produce modern product on the basis of consumer’s need and want. As the company is competing competitive market, it is very much important to have brand image. And brand image is developed with the vision, mission and service. These will be enclosed in the company profile part. SIC as its SBUs which are Sayma Enterprise cassettes, Sayma Enterprise PET, AHUJA, Wide electronics will be gathered in this page. All the activities of SIC will be clearly written in the web profile part. Sayma Enterprise’s products have just only reached the growth stage considering its sales and profit margin and having a good management, it has very few drawbacks. However, from the, questionnaire, observation and depth interview conducted during the internship, the following recommendations are made: These recommendations, I believe, if implemented, would give SIC competitive advantage over its competitors. In the survey it is seen that majority of the customers chose design variety option, as they would like to have new design of bottles. In different segments of market, there are different kinds of buyer and their tastes and needs also vary. SIC has 40 different design bottles and SIC products are in Variety – intensive stage. But they need to increase their product offerings to fulfill the customer demand. 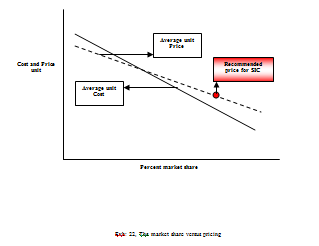 SIC should come up with more model variety if it wants to satisfy its customer demand by being in variety intensive position, red mark segment indicating the change. SIC could revise its R&D department and become dynamic, if SIC prefers to follow a rapid rate of change in technology. This will ensure a greater product model variety and offers more option to the customer. In case of industrial products, price is a very important factor for selling it. It is noteworthy that there is very less customer loyalty in industrial products. The condition become even worse when we consider the factor that, in our survey price turns out to be the major element for which customer switching among brands takes place. As we know SIC is manufacturing industrial goods, so they can cut production cost and set the price accordingly to satisfy customer demand. Low price will help SIC to gain market share over competitors and particularly discourage new entrants to enter in to the market. Existing customer will be happy and the chance of switching would be reduced. People are now a day busier at the work place. In our survey we have seen that if SIC wants to launch a new product, 24% of respondents said advertising is the best way along with the negative referral of 72% respondents saying they never saw any advertisement of SIC before or cannot recall advertisements of SIC form their minds. So if SIC wants to promote their brand, they can consider starting newspaper advertisement of their product in an effective media. In order to increase the number of customer, i.e. attract new customer or at least increase the brand awareness of the product, advertisements can be effective promotional tools. Customer most favored newspaper is “Prothom Alo”, so SIC should place this kind of advertisement in Prothom Alo. SIC as a whole can think of online marketing. In our survey we have seen most of the customer order once in a month. So there is a communication gap, most of them do not know or are not in track of what is going on in SIC. Web page will help them to solve these kinds of problem. Besides that, online marketing will provide them the unique advantage to save their time. Web page will keep the customers up to date. Web page will build a corporate image for SIC. In our survey we have found that 40% of customers place their orders through sales force. So an effective sales force that can give effective presentations is a must for SIC. To make them more organized, SIC can provide them a brochure which will help sales people to communicate with the customer efficiently. It will also ensure a two-way communication. Brochure will help customer to identify their choice design. Sales people will fill comfortable to communicate with the customer. Out of two major buying situations of business market; SIC’s is a new buy situation when it looks for the new buyers, where the buyer of the relevant district wants to modify or change product specifications, prices, suppliers. In case of new buy situation, various functional departments have various level of influence in the organization purchase decision. As we can see from the above graph, purchasing department and Engineering department have the most important role to play in the new purchasing decision. Therefore, one of SIC’s business strategies should be to contact these people in various organizations which are of interest to SIC through mail, personal appointment and media advertising and try to convince them that its design is providing better offering than any other competitor. The first P of Marketing is Product. In our case, SIC is offering a container to its industrial buyers for containing their product. Thus, the core product is a container for the respective buyer to keep his/her manufactured product. The actual product of SIC is a strong container made of PET, a hardy and cost-effective material for making plastic containers. Thus the actual product that SIC offers is a trustworthy and cost- efficient packaging to its clients. Here, I suggest SIC providing the augmented product, inclusive of credit facilities and logistic facilities free of cost to those clients who fulfill certain criteria, such as purchase of a certain quantity, or the frequency of purchase of a client. The promotional strategy that Sayma Enterprise can adopt is quite simple and straightforward. The following exhibit illustrates this. Source: Principles of Marketing; Kotler and Armstrong; page: 437. Exhibit: Relative importance of promotion tools in consumer versus business markets. As the above exhibit indicates, “Push” promotional strategy is an adequate approach for business goods. As Sayma Enterprise is selling industrial goods, more emphasis should be given towards personal selling and sales promotion than advertising and sales promotion. Hence, the promotional strategy should be “Push” rather than “Pull”. This given project has provided a clear image of today’s competitive marker situation. From all the aforementioned analysis it has been found that an effective blend of promotional mix can create a huge effect on business activity in any industrial organization. As SIC is manufacturing industrial products, it approaches directly to the industrial buyer. So, all the promotional tools should be used proficiently. The marketing tools are mainly based on the four Ps of marketing. These four P’s are very much related to the customers. SIC translates the 4 Ps of Marketing into 4 Cs. SIC translates Product into Customer Need, Price into Customer Cost, Place into Customer Convenience, and last but not the least, Promotion into Customer Communication. And as highlighted earlier, Promotion is 99% Communication and 1% Selling. Thus, there is more and more opportunity in capturing the new unsaturated market using promotional tools. This report gave me an opportunity to incorporate the theoretical concepts with the practical problem situation. It was a great opportunity for me to understand the current promotional mix strategies followed by few recommended strategies for SIC.